Watch Thomas Pieters snap his putter in anger after a quadruple-bogey in Switzerland. Thomas Pieters was left without a putter for his closing few holes at the Omega European Masters after letting his frustration get the better of him in Switzerland. 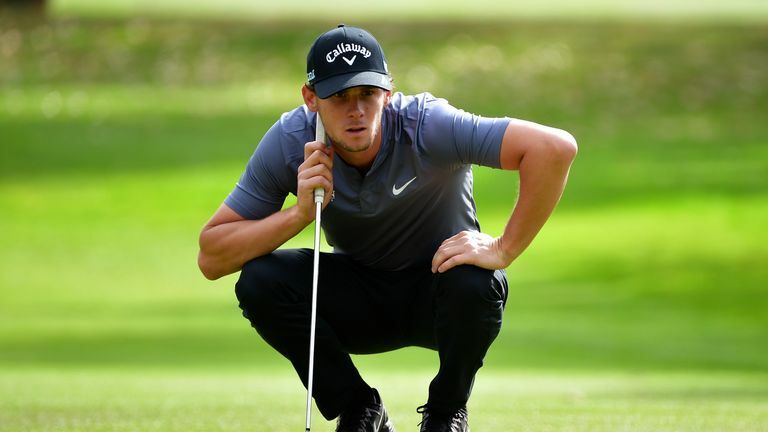 On the same week the Belgian found out he had missed out on a Ryder Cup wildcard spot, Pieters had a torrid time on the golf course as he struggled to a second-round 77. Three off the lead after the opening round, Pieters bogeyed three of the first four holes on his way to a front-nine 36 before losing further ground with a double-bogey at the 12th. Needing to make the most of the two par-fives to have a chance of making the cut, Pieters tried to attack the 14th green in two but came unstuck as he found the water hazard. Pieters found it again on his way to racking up a quadruple-bogey nine, where he promptly snapped his putter against his knee in anger as he walked off the green. It isn't the first time one of Pieters' clubs has been intentionally damaged, as he snapped an iron around his neck during the BMW PGA Championship earlier this season. Click on the video above to see Pieters lose his cool! Watch the Omega European Masters throughout the weekend live on Sky Sports Golf.